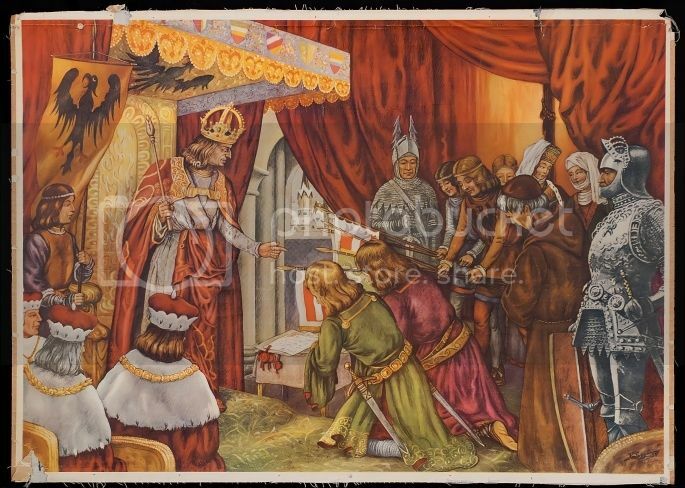 Rudolph I of Germany receiving oaths of fealty from his subject lords. - Rudolph I of Germany is elected King of Germany over the rival candidate King Otakar II of Bohemia, ending the Interregnum; Otakar refuses to acknowledge Rudolph as the new king causing tensions between the two to rise exponentially. - Thomas Aquinas quits his writing of Summa Theologica, leaving it unfinished after having a mystical experience during mass. - The Constantinople suburb of Galata is given to the Republic of Genoa by the Byzantine Emperor Michael VIII Palaiologos, in return for Genoa's support of the Empire after the Fourth Crusade and the sacking of Constantinople. - King Otakar II of Bohemia captures Bratislava from Hungary. - Alfonso X of Castile creates and grants privileges to the Mesta to promote the wool industry. 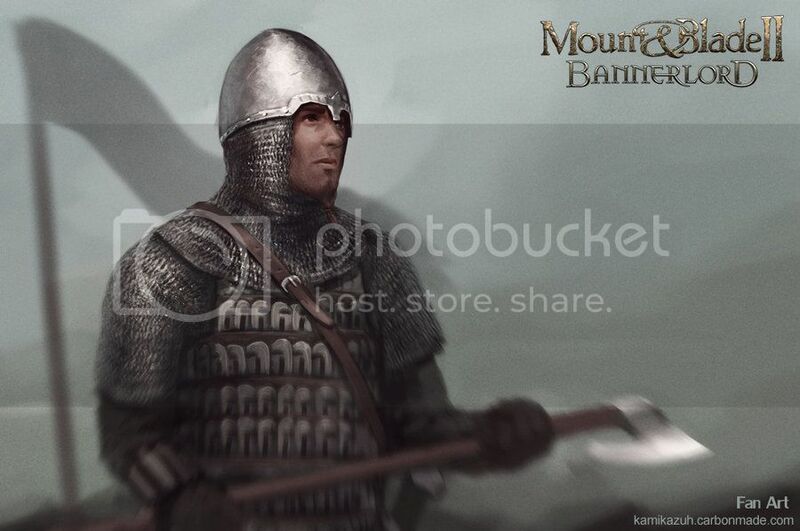 - The Sultan Baybars captures the last remaining stronghold of the Hashashin sect, al-Kahf Castle. The Syrian branch of the famous Assassins now carries out their services for the Mamalukes of Egypt. - Followers of the recently deceased Jalal al-Din Muhammad Rumi establish the Sufi order of the Whirling Dervishes in the city of Konya, in Anatolia. 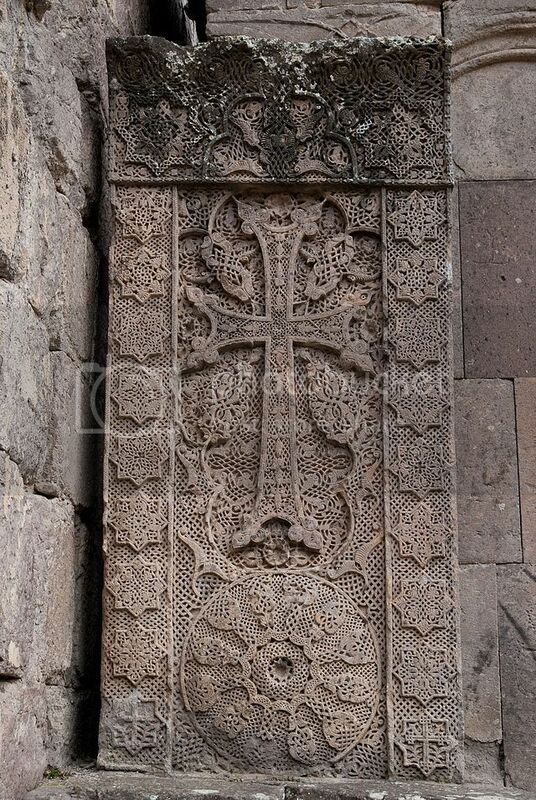 - The "Holy Redeemer" khachkar, one of the finest examples of the art form, is carved in Haghpat, Armenia, by Vahram. - The 6-year-long battle of Xiangyang ends as the commander of the Song Dynasty's forces surrender to Kublai Khan's Yuan Dynasty. The final battle is said to have been ferocious. 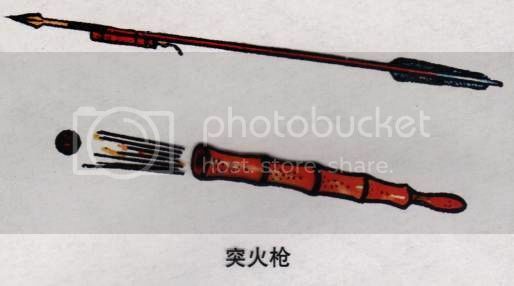 A new weapon, known in Asia as a 'Fire Spear' was said to be used. - In Korea, the Sambyeolcho Rebellion against the Goryeo Dynasty (a puppet government of the Yuan Dynasty) ends as rebel forces are defeated by combined Yuan and Goryeo forces. 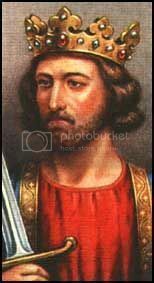 - Alphonso, Earl of Chester, son of Edward I of England is born. He is Edward's 9th Child. - David VIII of Georgia, son of Demetrius II of Georgia is born. - The Second Council of Lyons, held by the leadership of the Roman Catholic Church convenes to consider the liberation of the Holy Land via Crusades and to address the East-West Schism with the Byzantine church. The Council eventually approves a tithe to support efforts to liberate the Holy Land from Muslims, and reaches apparent resolution of the schism. - Bonvesin de la Riva writes the didactic-allegoric poemet Libro delle Tre Scritture (Negra, Rubra, Aurea), the first text in ancient Western Lombard language. It tells about Hell, Christ's Passion and Paradise; this plot suggests Dante in his Comedia. - Pope Gregory X decrees that conclaves (meetings during which the electors have no contact with the outside) should be used for papal elections, reforming the electoral process which had taken over 3 years to elect him. - Joseph ben Abraham Gikatilla writes Ginnat Egoz (Garden of Nuts). - King Edward I of England finally returns from the Ninth Crusade to England to be crowned king, 2 years after his father King Henry III's death. His interim chancellor and effective regent, Walter de Merton retires from royal service to make the final revisions to his statutes for the foundation of Merton College, Oxford and take up the post of Bishop of Rochester. - One of Edward's first acts is to enforce a decree requiring all English Jews to wear yellow badges. - The first main survey of the Hundred Rolls, an English census seen as a follow up to the Domesday Book completed in 1086, is begun. - The Marinid Amir, Abu Yusuf Yaqub, enters peacefully into Ceuta putting an end to some forty years of independence of the city. 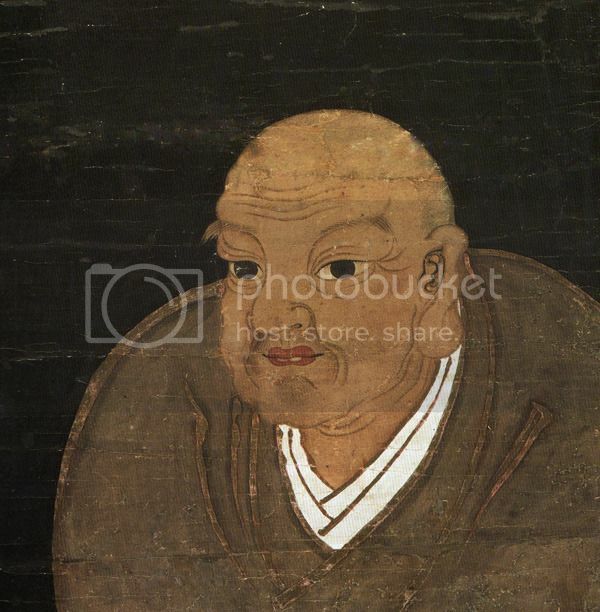 - Nichiren, founder of Nichiren Buddhism, enters exile on Mount Minobu. - Louis of Toulouse is born. He is the second son of Charles of Anjou and Maria Arpad of Hungary. - Robert the Bruce is born. Robert was is the first son of Robert de Brus, 6th Lord of Annandale, and Marjorie, Countess of Carrick. -September- The diet at Nuremberg orders that all crown estates seized since the death of Frederick II, Holy Roman Emperor be restored to Rudolph I of Germany; almost all rulers agree, with the notable exception of King Otakar II of Bohemia, who has benefited greatly by conquering or otherwise coming into possession of many of those lands. -September- Battle of Polgárdi - Peter I Csák, a powerful Hungarian Baron, and loyal soldier to the King moved his forces against Hungarian nobles Gutkeled and Kőszegi. The two nobles were responsible for kidnapping the King and his mother in June, but they were rescued by Peter I Csák. By September only the King's brother remained in their custody, and kept as hostage in Slavonia. However, Peter I Csák defeated their united forces near Polgárdi, successfully rescuing the Hungarian King's brother from harm. -September- The Queen Dowager Blanche of Artois, Regent of Navarre and the County of Champagne has taken refuge in Paris, and has paid homage to King Philip III. -September- Venice invests in the expansion of its salt industry within the Lagoon. Warehousing and organisation are improved to make it easier to export and lower the prices of salt for Venetian use. The 'ordo salis' is also passed. Venice, with a virtual monopoly on salt for preservation of foods, sees its income begin to rise quickly. -September- Venice also expands its banking branches to various parts of Italy and the Southern Holy Roman Empire. Money lending services and trade continue to see improvement. Venice continues to rise as a lucrative partner to those monarchs looking to borrow money or expand trade relations to incorporate the merchants of Venice. -September- Angevin forces under Philip de Lagonesse advance to Chivasso, through undefended Genoese Territory along the coast. Philip's forces come upon the city, just under 5,000 strong. Outnumbered, the forces of Asti and Montferrat choose to remain in the city. 450 City Guard, and Condottieri troops await the assault on the city. The trespass on Genoa's lands, along with the attack on their allies will no doubt spur Genoa into action against Angevin Sicily in the following months. -September- Rumors spread that Napoleone della Torre, Lord of Milan and Vicar-General of Lombardy, has begun heavily recruiting bands of mercenaries with intend use on the surrounding lands. Locals, loyal to the Guelphs around Milan find the rumors worrying as it is plain for them to see that della Torre may in fact be a turncoat who has switched sides, ever since King Rudolf was elected as Holy Roman Emperor. The Emperor has already rewarded him with titles, surely more land is the next benefit he will reap for turning his back on the Guelph Cause. As a result, neutral parties in the Guelph-Ghibilline war begin to flock to the rebels under Ottone Visconti, who is said to be preparing to act against Napoleone della Torre for control of Milan. Guelph supporters also shift a bit, distancing themselves from della Torre. -September- Eric Birgersson is made Earl of the Faroe islands upon the order of King Magnus of Norway. In return, the Swedish noblemen has agreed to pledge loyalty to the King of Norway. The agreement states lands will be forfeit to the Norwegian crown, should Eric pass away without an heir. However, should he not pass without an heir it'd likely go to one of his brothers. Eric Birgersson sets sale at once to rule over his new fiefdom with a small contingent of household guards loyal to him. -September- King Magnus of Norway, as a gift to the faithful of the Church in all of Northern Europe, begins heavily refurbishing the 'Pilgrim's Route' throughout Norway. The roads are improved, more waystations, stables, watering holes and taverns for weary travellers have been built, and more roadside markers to show the way were erected. -September- King Magnus also introduced new and efficient agriculture and wool-production methods to Iceland, through inviting the Cistercian monastic order to Iceland, in hopes that their work there will increase the agricultural and economic output of the region. The King has donated a tract of royally-owned land on Iceland to the Cistercian Order, who bring a set of their monks there, and build some simple housing. The monks are given whatever basic equipment they need. The Kings only demand is that they work hard in the name of the Lord, and dedicate the monastery's abbey to Saint Olaf. -October- Pope Gregory X announces the Papacy has begun receiving donations to the Church in order to secure a contracted fleet to carry Crusaders to the Holy land in two years time. Along with his refelction on the Council of Lyon, Pope Gregory made a request to Emperor Michael VIII to replace Joseph I, Patriarch of Constantinople as he was strongly opposed to the Union of the Churches. John XI, was the replacement the Emperor chose after dismissing Joseph I. This builds a good amount trust with the Papacy. However, the views Joseph I held on the Union of Churches were views also held by the populace under Emperor Michael VIII. Orthodox Christians in Constantinople are very unhappy with the actions of their Emperor, and see his actions to please the Pope as the actions of a Papal puppet. Discontent swells and civil unrest breaks out in Constantinople, distrust runs rampant, and the leadership of the Emperor is questioned. -October- Battle of Chivasso - Early on an October morning, Chivasso has found itself under assault by the force of Angevins that arrived on its doorstep in September. As the Angevin forces advanced, the forces of Montferrat and Asti sallied forth against the invader. In their minds, the cities' future was at stake. It was their only choice to save it from the decemation of siege, as the thought of surrendering in their captains' mind was unspeakable. Brave men these were, standing up to far larger a number, but brave men do not live long lives. A couple units of Angevin Italian Militia were bloodied bad enough to scatter to the wind however. -October- Charles I, at the head of an army of over 3,000 men, departs from Naples heading north-west through Italia. After passing by Rome, Orvieto, through Florence and Bologna, his forces enter Lombardy. Along the way token forces from Guelph-held cities have joined him, in hopes that he will, by force of arms, expel all Imperial influence from Italy. -October- The Entire 12,000 man army of the Greek Empire is mobilized and sent to the eastern border, to patrol along the boarder of the Muslim Turks. They arrive under the Commander of the Emperor himself. Becoming nervous, the Turks of the Sultanate of Rum begin making plans to mobilize their troops in case of a Greek incursion. -October- King Magnus of Norway focuses on expanding whaling near Greenland, to extract meat, bone and whale oil for trade markets and local use. The Worshipful Company of Whalers is formed and several local ships are paid for and equipped for the task at hand. The King's investment in the establishment of this new whaling guild will continue to see growth over the coming years, that is of no doubt. -October- Along with the Norwegian King's investments in whaling, He also invests in fishing, particularly for herring. Plots of land are offered for fishermen migrating to the region of Viken to settle and use for fishing, fishing wharfs are built, and fishing equipment is imported. The production of stockfish is a focus, and the export value of herring and other fish grow as demand throughout Europe soars. -October- The Kingdom of France invests in the expansion of its wool industry in Flanders which provides a generous boost to the French economy. Along with this more wineries are being built outside large cities and production is increased as city dwellers are drawn into laboring in the wineries. -October- French Invasion of Brittany - To the suprise of John I, Duke of Brittany, King Philip III of France ordered his army of 5,550 men to march into Brittany, with the French King himself leading the invasion. King Philip claims that John I illegally took the titles Count of Penthievre and Porhoet after the death of Yolande - and that furthermore, he had sought to swear fealty to England. King Philip claimed that as King of France, heir to the Carolingians, there is a duty to uphold justice, and protect the Duchy of Britanny from foreign conquest. King Philip has also taken the side of Guillaume I de Vern, Bishop of Nantes in his quarrels with the Duke. -October- French Invasion of Brittany - King Philip III and his army march to, and surround, Nantes. Equipped with a trebuchet, the townfolk was convinced that it was in their interests to open the gates to the French as no defensive forces were garrisoned in the city. A decree was made that no looting or harm would come to the city as a result of them opening their gates to the French Army. The Bishop of Nantes's guarantee of submission to the French, enabled King Philip to leave a token garrison under the Bishop's command within the town. Moving on from Nantes, Vannes on the southern coast of Brittany is also captured without a fight, but is left unoccupied by the French. Brittany's fleet set sail before the French arrived however, so as not to be captured. -November- Battle of Rennes - As King Philip approached Rennes, capital of Brittany, Duke John I was found forming his battle lines outside of the city. Determined to fight and not be seen as a coward, the Duke readied his men. 1,200 Troops of Brittany, and 4,800 Frenchmen prepared to face off in what Duke John believed was an unprovoked war of aggression by the French King. As the battle commenced Duke John's forces courageously advanced onto the lines of the French, sprinting towards the lines as they closed ranks. The majority of John's forces met Drossbowmen who could not get away fast enough. The French army suffered the loss of 2 Units of Crossbowmen. However the overwhelming strength of the cavalry contingent in King Philip's army rode down the majority of Duke John's men, even his mailed knights were little match. Altogether, Brittany lost 7 units. Duke John himself escaped from the battlefield, and rode off towards Brest, undoubtedly to gather more men. Duke John has also issued a plea to the English King to intervene, and come to Brittany's aid. -November- While travelling through Tuscany, of which he had been appointed Vicar-General, Charles I has elected to choose a Sicilian, not yet named, as Vicar-General, rather then remain with the precedent of a Frenchmen in the position. This causes some French nobles to raise an eyebrow. Further direction has been given that all sub-vicars be Lombards or Tuscans - natives of these governed lands, to aid in the better administration and acquiescence of the lands. -November- Surrender of Pavia - Charles reaches Pavia, and camps his army around the city, cutting it from supply. The force of Condottieri defending the city weigh their options, and with winter coming, they choose to surrender the city to the Angevins. A garrison force of a Quarter men remain in the city as Charles presses on to combine forces with Philip de Lagonesse in the west. -November- The Angevin fleet leaves Naples, to dock in Marseilles. -November- The Byzantine Empire signs a trade deal with its ally, the mercantile city of Genoa. -November- Arch-Bishop Jon Raudi of Norway is invited to feast with King Magnus of Norway at Ragnhildsholmen Castle. The topic of discussion was the future of Chistianity in Norway, to which it seems the Arch-Bishop has found a sympathetic ear. The recent call to a Crusade is discussed and the King swears men to the cause when 1278 comes, as the Pope wills it. The topic of sending Christian missionaries to preach the faith to the heathens who live at the borders of Norweigen lands (Inuits and Sami) is disscussed much to the pleasure of the Arch-Bishop. Plans of investment in furthur church growth in Norway is also well received by the Arch-Bishop. -November- In Naples, Charles I has presented orders vastly improving the city, and every facet of life there. Various building projects are begun, new roads, sewer systems and reparations on older buildings are at the forefront. Angevin patronage on the arts and sciences has increased at an unprecedented pace. Artists, literary minds, sculptors, architects, poets, mathematicians, scientists, doctors who live in cities with warring factions, see Naples as a safe haven to practice their studies in peace, without the misery of conflict to impede them. Angevin patronage of universities and churches is also extended, further advancing the joys oflife and learning in Naples. -November- Late on a November night in Naples, Philip of Courtenay, Latin Emperor in exile and recently recruited commander of Charles I was found in his bed, dead from multiple stab wounds to the heart. Wrapped in sheets soaked with blood, it appears Philip died before he knew what was happening. His guards had not reported hearing, or seeing anything out of the ordinary. His wife, Beatrice of Sicily survives him as she was out of the room, in labor. The next morning Catherine of Courtenay was born without a father. -November- The King of England attempted to encourage banking guilds to come to England with a sizeable investment, however not many do, due to their main land of opportunity remains in Northern Italy. The English do however pay of a good amount of debt, freeing up much needed capital for furture investments. -November- Due to lack of military activity, many levied troops within the English army return to their fields to reap the season's harvest before winter. -November- Nikephoros, Ruler of Epirus, has entered into an alliance with King Charles I of Naples. His half-brother, John I Doukas of Thessaly, also joins into an alliance, after negotiating with Duke John of Athens, a vassal state of Charles'. The two alliances effectively form a coalition of the Kingdoms of Sicily and Epirus, and the Duchies of Athens and Thessaly. All parties of which hold opposing politics towards the Emperor, Michael VIII Palaiologos. The coalition threatens to turn Greece into a hotbed of resistance. Cavalry of the Sultan Baibers, Rides into a Makurian town,slaughtering its inhabitants. - October- The Sultan Baibars continues his invasion and conquest of the Kingdom of Makuria, south of Egypt. 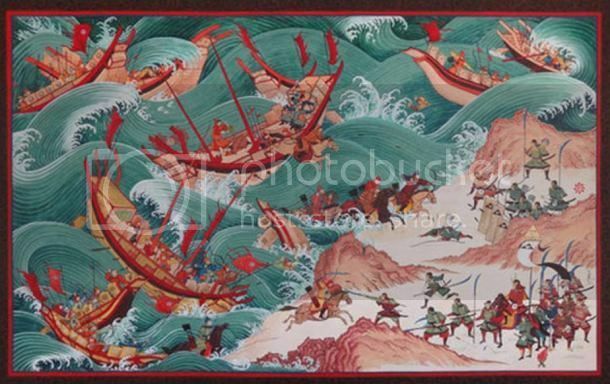 An illustration of the events that took place during the Mongol invasion of Japan. A divine wind utterly destroyed the Mongol fleet, forcing Kublai Khan to turn his forces back to China. -November- Kublai Khan's Yuan Dynasty attempts its first invasion of Japan (30,000 soldiers and support personnel sail from Korea); after the Mongols capture outlying islands, they are repulsed on the main island at the Battle of Bun'ei by amassed Japanese warriors and a strong storm which batters their forces and fleet. Credit for the storm — called a kamikaze, or divine wind — is given by the Japanese to the god Raiden. 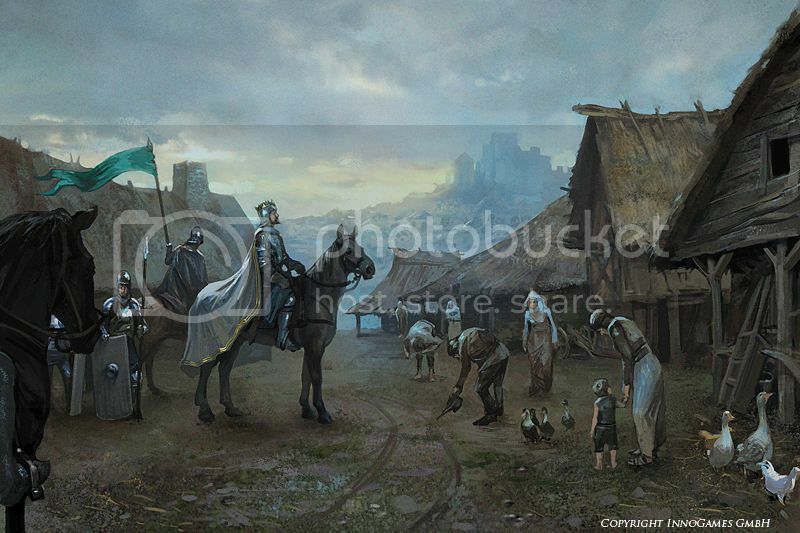 King Phillip III of France converses with Breton peasants outside Brest, as his forces prepare for seige. -December-A small force of Genoese condottieri moved to encamp themselves outside of Imperia. From their camp they begin raiding Angevin supply lines moving along the coast. The loss of supplies is making life hard for Charles I, and his forces in Northern Italy despite a moderate winter. -December-The Kingdoms of England,Aragon & Hungary make decent size donations to the Holy Church to be used towards the next Crusade. -December-The troops and castle guards in Naples conduct a thorough search of the city for the assassin responsible for the death of Philip of Courtenay. It would seem as though the assassin gained access through the bedroom window of Philip of Courtenay. A considerable feat given how high it is from the ground. City Guards seize man complicit with the crime, and toss him in a dungeon. However no weapon is found on the stranger. -January-The verge escapement, a simple type of escapement used in clocks, is invented. -January-The first main survey of the Hundred Rolls, an English census seen as a follow-up to the Domesday Book completed in 1086, is finished. -January-Jean de Meun completes the French allegorical work of fiction, Roman de la Rose, with a second section; the first section was written by Guillaume de Lorris in 1230. -January-In Ghent, first recorded instance of emission of life annuities by a town in the Low Countries, this event confirms a trend of consolidation of local public debt in north-western Europe initiated in 1218 by Reims. -January-Ramon Llull establishes a school in Majorca to teach Arabic to preachers in an attempt to aid proselytizing to Moors. He also discovers diethyl ether. -January-The era of the tosafot (medieval commentators on the Talmud) ends (began 1100). -January-After the Expedition Charles I launched into Northern Italy, Genoa sent forth two fleets to block Angevin ports. 1 fleet has blockaded Marsille, trapping the Angevin Navy. The other has blocked Naples, hindering some trade coming from Achea. -January-Battle of the Port of Marsille-The blockading Genoese fleet of 20 Ships moves on the Angevin fleet of 10 Ships. The Genoese destroy 7 Angevin Ships and capture 3, at a loss of 8 of their own. -January-Peter Csák launched a campaign against Kőszegi's son with King Ladislaus accompanying him. Kőszegi's son was tracked down and killed by Peter Csák's forces. -January-Baron Nicolas de Segrave, is placed By King Edward I at the head of an Army sent to the English lands in Aquitaine. Braving the winter sea, The Baron and his Army land in Bordeaux. Many Frenchmen boardering the English lands have become worried that The English will answer the plea of help from Brittany once Winter passes. -January-Due to fears of accidental fires, the Venetian council passed a law that would order glass makers to move to the lagoon island of Murano. They have been assisted by the Republic ginancially in the relocation and expansion of glass foundries on the island. From this, they have rendered benifical gains. -January-The Republic of Venice, looking to expand it's lending capacity pays of monies owed to individuals it was indebted too. -January-A Decree has been issued by the council in Venice requiring non-Ventian bankers seeking to operate in the Republic to register with a Venetian banking house as a business partner. The goal is to ensure honesty and fairness in plain dealing. The foregin bankers operating in Venice are now obliged to operate according to all Venetian rules & regulations. -January-Charles I of Naples promotes one of his Sicilian Knight-Captain's to the position of Vicar-General of Tuscany. His choice Constantino Fiore, is a deeply faithful man who displays fine horsemenship. French nobles scoff at the choice, while Sicilians welcome it. -January-Prince Charles of Salerno, Son of Charles I of Naples extends invitation to 12 year old King Ladislaus of Hungary and his Queen, his sister Elizabeth, to his estates in Salerno. Peter I Csák however cautioned the young Ladislaus, that leaving his realm at this time would only spread discontent in Hungary. Thus the Hungarian King had to decline the invitation of Prince Charles of Salerno. -January-In Pavia & Chivasso the Angevins maintain a policy of no taxation on the inhabitants of the city. Local affairs are watched over by Angevin troops there to maintain peace, and have thus far prevented looting. They have also mandatedan equal share and say in the rule of the cities to Guelph and Ghibelline representatives. Violence towards the Ghibellines has also been prohibited. Seizure of their property, save where gained by corruption or ill-means - and trials are given in all those cases so they may fairly defend their positions. Guelphs do not agree with the treatment of their enemies, yet remain silent on the matter for now. -January-Local Sicilian Knight-Captains are appointed to govern Pavia and Chivasso, under careful watch of Naples. Throughout Pavia and Chivasso/the March of Montferrat Lomabards and Tuscans are appointed as sub-vicars. -January-The Captured Condottieri from Pavia and Chivasso have been given the choice to join the Angevin forces. They do so, seeking to remain employed. -January-Mercenaries begin collecting taxes on behalf of Napoleone della Torre.The Mercenaries are rough and unruly, causing a great deal of unrest amongst the people of the territory taxed. -January-Siege of Asti-King Charles I combined his forces with that of Phillip of Langonese. Now nearly 7,000 men strong King Charles I brings his forces to the city of Asti. 300 City guard stand ready to defend the city's walls in a siege. They hope that reinforcements from friendly cities come to their aid, particularly Genoa & the Holy Roman Empire. -January-Battle of Asti-Before help can arrive to Asti, King Charles I orders an immediate attack on the poorly defended city. Trees are cut, and lashed together to make crude ladders & Hardier trees felled for battering rams. King Charles set his forces upon Asti's walls with all haste. Unable to defend the wall, the battle quickly tipped in favor of the Angevins. Once their Rams breached the gates and ladders reached the Wall, Asti's forces faced invevitable defeat against the force of near 7000 men. Blood drenched, Asti's walls and its defenders are vanquished at the loss of 2 units of Angevin troops. Philip of Langonesse is left behind with a garrison force of 900 men, as King Charles I Marches south towards Genoa, where his forces occupy Voltri, just outside of Genoa. -January-Siege of Brest-King Phillip III of France and his force of 4,500 men leave Rennes, and head west for Brest. The French army surrounds the town, encamping itself, ready for a siege. Meanwhile the French Navy also arrives to blockade the town by sea. The strain on Brest's inhabitants will likely become apparent in a few months once their winter stores dry up. The 450 defenders in the town wait desperately for help that may never come as they begin to starve. -February-The Byzantine Empire begins bringing building materials to its frontiers in Anatolia. The Emperor has ordered the army and its engineers to build a string of watchtowers along the eastern frontier in order to give advanced warning to any Turkish military movements. Military engineers anticipate the project will be completed in July. -February-General Alexios Strategopoulus has been placed at the head of a Byzantine Army based in Heraclee, christened the 'Legion of Anatolia'. It has been placed to deter the Turks, that is of no doubt. Back in Constantinople unrest continues. The Emperor has entrusted a lower ranking admiral by the name of Lakobos Giannopoulus, a flamboyant commander with extensive connections with the lower classes, to help keep prevent the city from erupting completely. The Marines under him, along with the Byzantine Army still within the city patrol the streets and arrest those who disturb the peace. -February-King Rudolf of the Holy Roman Empire has placed an imperial ban on King Ottokar II of Bohemia.This was done after Rudolf decreed that all Imperial lands that had changed hands since the death of the last Hohenstaufen emperor Frederick II must be returned to the crown. This would have deprived Ottokar not only of the Egerland, but also of the Austrian, Styrian, and Carinthian duchies. King Ottokar refused to acknowledge this, and King Rudolf's election as Holy Roman Emperor. The Bohemian king now awaits inevitable attack in Vienna. Baibars forces attack a Makurian garrison. -January- Sultan Baibars continues his consolidation of power in the Kingdom of Makuria after invading last year. It would seem his plans are going well as Makurian resistance has been sporadic and unorganized. -January-The troops of the Marinid dynasty take the city of Algiers, Like Ceuta, Algiers was also an independant city.